Director: Stephen Daldry. Cast: Jamie Bell, Gary Lewis, Julie Walters, Jamie Draven, Stuart Wells, Nicola Blackwell, Jean Heywood. Screenplay: Lee Hall. Let's get one fact straight from the beginning: the makers of Billy Elliot are decidedly NOT okay with the fact that adolescent Billy wants to learn ballet. Though ostensibly an endorsement that people should be free to express themselves, even working-class British boys who hide toe shoes under their mattresses, Billy Elliot seems so profoundly anxious about its protagonist's behavior that it relentlessly conjures unnecessary subplots, characters, and backstories either to excuse or to distract from its own central events. Billy dances because . . . well, take your pick: 1) He doesn't want to be a miner, especially in a town where the miners are striking and are routinely beaten by police; 2) The early death of his mother has left him without a nurturer, a role for which his ballet instructor seems qualified; 3) He is helpless at boxing, which is what he's supposed to be doing at the local gym; 4) His grandmother, now afflicted with Alzheimer's disease, once had dreams of being a professional dancer . . . I think the film doth protest too much; when a screenplay has to provide at least four reasons, most of them unconvincing, for its fundamental narrative premise, it's a good sign that the writer has no idea what he's doing, or why. Late in the film, Billy is asked why he wanted to learn ballet, and I was quite curious to hear his answer. He didn't have one. The movie has, I suppose, a few strong convictions, but these tend to range from the irrelevantthe screenplay insists so repeatedly that Billy isn't gay, the film seems as paranoid about homosexuality as Billy's father isto the outrageousfor example, that parents who love and support their children shouldn't join unions and participate in strikes. Despite all this, Billy Elliot lacks answers to its two most important questions: why does Billy do what he does, and does he even do it well? A recommendation: if you don't know who your protagonist is, or you're exaggeratedly nervous about his activities, you shouldn't make a movie about him! For all intents and purposes, the list of faux-motivations in the first paragraph gives you all the info you need about the plot. Billy lives in an English coal-mining town riven by a strike. Billy's father (Gary Lewis) and older brother (Jamie Draven) are among the most vocal of the union strikers, though their shouting is not confined to the picket lines. Screaming matches and even physical blows transpire with some frequency in the Elliot household; some of these flare-ups involve Billy, others don't. By contrast to the Elliot men's hot tempers, the tough love of Mrs. Wilkinson (Julie Walters), the ballet instructor at the local gym, seems almost inviting. Billy Elliot's helpless discomfort with its own story is already evident, though, in the tremendously awkward sequence which introduces him to Mrs. Wilkinson's class. I leave out no important details by summarizing it this way: he is waiting to hand-deliver the gym keys to Mrs. Wilkinson, and because she is too busy to accept them, he puts one hand on the bar, his ankles together, and the rest is history! Convoluted history, but history nonetheless. And by the way, for all the Dancing Is Not Effeminate rhetoric that permeates the film, rookie director Stephen Daldry is happy to squeeze laughs out of watching Billy in his boxing shoes duplicating the moves of his pixie-ish classmates. The fact that his performance is flawless, at least in this scene, makes clear that it's Billy himself, not his movements, that is supposed to be funny. The film's failure is all the more shocking because, in following such a long tradition of Be Yourself movies, it doesn't need to do anything but show its lead character doing what he loves, and impart some notion of why he loves it so much. Absurdly, though, we see very little of Billy dancing, and most of what we do see are sight-gags of Billy tripping, losing his balance, falling down, even falling into a bathtub while trying to practice his new passion. In fact, even the sequences that allegedly demonstrate Billy at the height of his "abilities" tend to resemble that bizarre moment in The Breakfast Club when Emilio Estevez frees himself from the pressures of being a WASPy high-school wrestling star by running around the school library, playing furious air guitar, and careening into bookshelves. 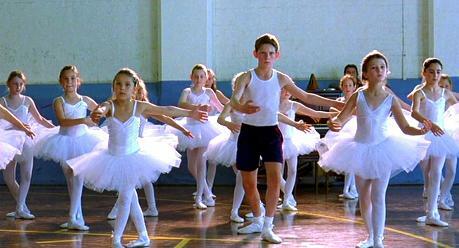 My point is not so much that Jamie Bell, an appealing-looking lad making his film debut as Billy, does not dance well. Rather, my point is that the movie barely asks him to do any dancing; when he does, the emphasis is more on releasing energy than on refining a craft. As a result, during a crucial scene of Billy auditioning before a stonefaced dance-school admissions board, I had no idea if his hyperkinetic display was a triumph or a flop. Clearly, Billy Elliot shows none of the understanding of Billy or respect for dance that Karyn Kusama's otherwise similar Girlfight demonstrates in relation to Diana, its tough, complicated heroine, and the sport she embraces. Part of Girlfight's strength lies in its confidence that, notwithstanding Diana's troubled relationship to her father and her lack of a mother, she takes up boxing gloves because, quite simply, she wants to. Moreover, she perceives boxing to be a complicated activity with its own techniques and disciplines, which can't be faked. Kusama, therefore, would never dream of concocting scenes in which Diana shadowboxed corrugated iron walls, danced a wild, kicking frenzy in an outhouse, or stood on a city wall watching striking workers be clubbed by police, as though to express, "If only all these people had found the right pastime as youngsters, there wouldn't be labor conflict." The careless way Billy Elliot portrays the strikers is actually more insensitive than it would have been to drop the storyline entirely. As it happens, once the obligatory happy-ending machinery gets steaming, Billy's father and brother, as well as the whole hardscrabble neighborhood, drop their homophobic, sexist outrage at Billy's dancing and start collecting money to pay for his bus ticket to the audition site. Mr. Elliot even crosses the picket line to get the funds, thereby violating everything we know about his character (and every half-credible appreciation for his circumstances). The list of scenes Billy Elliot mishandles is so long that it would be both tedious and unkind to reproduce them all. Here's a condensed version of clichés and groaners: pillowfight as height of innocent exuberance; verbatim repetitions of identical dialogue; fantasy visions of a dead relative; black man as Exotic Other (he's not even listed in the end credits! ); brisk montage covering Billy's "improvement" as a dancer, which should be the focus of the story, not a footnote. Suffice it to say that Daldry's newness to the medium is more than evident, both in his lack of control over the story and his shaky visual sense. Cinematographer Brian Tufano lights a cigarette-smoking Julie Walters in hazy, silhouetted long-shot before her first private session with Billy, as though he were filming Body Heat. Even worse is the entire musical score, both the mawkish instrumental melodies supplied by Stephen Warbeck (Shakespeare in Love) and the catalogue of classic rock anthems, many of them by T.Rex, that pop up beneath the strangest scenes: a domestic shouting match, even a production of Swan Lake! Though at times Daldry seems to reach for the intentional audio-visual garishness of Australia's recent comedies, he undercuts this possible direction through the over-serious shaky-cam of the police-raid sequencesdon't forget, you escapists out there, this film is Relevant! How, I ask, can the film speak coherently about Billy's identity when it can't even decide on one for itself? Still, none of this would have mattered if Daldry and company had committed to their story and told it simply, without distraction or defensiveness. Many of the supporting players seem unnecessary, and besides, we never know enough about them, and they never behave with enough consistency, to make them convincing as real people. At the same time, in contrast to their tragedies and preoccupations, impulsive little Billy starts to seem like the least interesting figure in the story, exactly the wrong character to hang the film on. Imagine Music of the Heart as narrated by one of the violin players, or Babe from the viewpoint of one of the puppies. Billy Elliot briefly strikes a spark in the relationship between Billy and Michael (Stuart Wells), his cross-dressing, sexually confused best mate, but even this plotline becomes a liability. One gets the sickly feeling that Michael's only here to provide an image of "real" homosexuality, by contrast to which Billy won't look so dubious. None of this matters!, I wanted to yell at the screen. Just show me why this kid wants to dance!